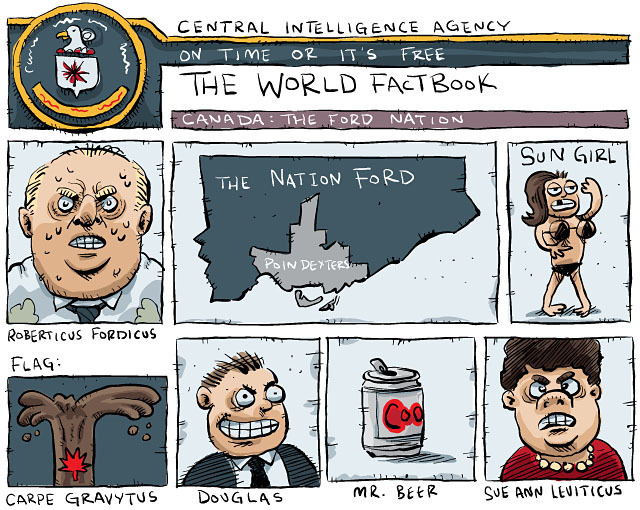 Introduction: Born in the early twenty-first century, Ford Nation rose from the ashes of a corrupt and wasteful city choked to death by streetcar tracks, bicycle lanes, and a whiny, petulant left-wing media. The state broke away from Canada after declaring itself a distinct society, but not before its founder successfully unleashed his millions of supporters on Ontario’s Premier, and then the Prime Minister, securing huge sums of cash. Today, “The Big Ford,” as the city-state is nicknamed, enjoys zero public debt, a vast, hyper-efficient, non-unionized subway system, graffiti-free streets, three NFL teams, and a safe downtown core where citizens can walk around without having to run into fights on every corner. Government: Ford Nation has the world’s most efficient government. Long ago, the country abandoned the cumbersome inefficiencies of a costly elected assembly, opting instead to just give out the leader’s cellphone number and to hold the occasional tele-town hall meeting. And thanks to a work-force attrition policy where only half the employees who leave are replaced, the civil service has finally shrunk to an appropriate size: just two unpaid interns and a part-time janitor (soon to be laid off). With the fat gone, police now have access to the funds they need to keep the streets safe, and more importantly, to ensure that every officer has his or her own helicopter. All other former government functions have been privatized, including everything from trash collection to housing for the poor—although poverty is no longer an issue for the state. Once the poor realized that they were lazy anarchists and went out and found jobs, the problem pretty much corrected itself. Media: The country’s media is dominated by the Toronto Sun and AM640’s John Oakley Show, which together provide comprehensive and hard-nosed coverage of wasteful city spending (which has been eliminated), and the Leafs. Culture: Thanks to an innovative revenue-generating strategy that relies solely on fundraising dinners to which people in the private sector can buy tickets, Ford Nation has transformed itself into a cultural dynamo. The country’s entertainment exports—which include the musical adaptation of Three’s Company and a play based on 1980s hit film Stir Crazy—have grossed billions worldwide. Football, however, still remains the pre-eminent pastime. Since its founding, Ford Nation has hosted fourteen Super Bowls at its three privately funded suburban mega-stadiums.